Hugh Hayden in his Bronx studio, 2018. Hugh Hayden’s artistic trajectory is a slow burn that continues to evolve. An architect by training, the Dallas native continued designing stores for Starbucks while pursuing an MFA in sculpture at Columbia, years into his career. It was risky for Hayden, whose lifelong artistic impulses manifested in a variety of ways, like his “culinary installations,” which remained in the periphery until recently. “A couple of years ago, I didn’t know I would ever show my work, but I believe in what I’m doing, so this moment is full of feeling for me,” Hayden says. America, 2018. © Hugh Hayden; Courtesy of Lisson Gallery. Freshly graduated from his MFA, Hayden had a fall solo show, “Border States,” at Lisson Gallery, where the sculptor is represented in New York and London, along with Clearing in Brussels. We met at the show on a fall Saturday and were greeted by a swarm of people—a mix of friends, curious strangers drawn from the street and art world types. Hayden gave an impromptu talk around the sole sculpture in the last room, a dark wood baby crib. Precious and simple from a distance, the interior of the crib reveals what Hayden calls a “terrible constellation” of whittled white thorns, their shape evoking sharp teeth. “I didn’t realize how mouth-like it would turn out,” he says to the bewitched group circling the sculpture. Installation view of “Hugh Hayden: Border States” at Lisson Gallery, New York (15 September – 27 October 2018). © Hugh Hayden; Courtesy of Lisson Gallery. 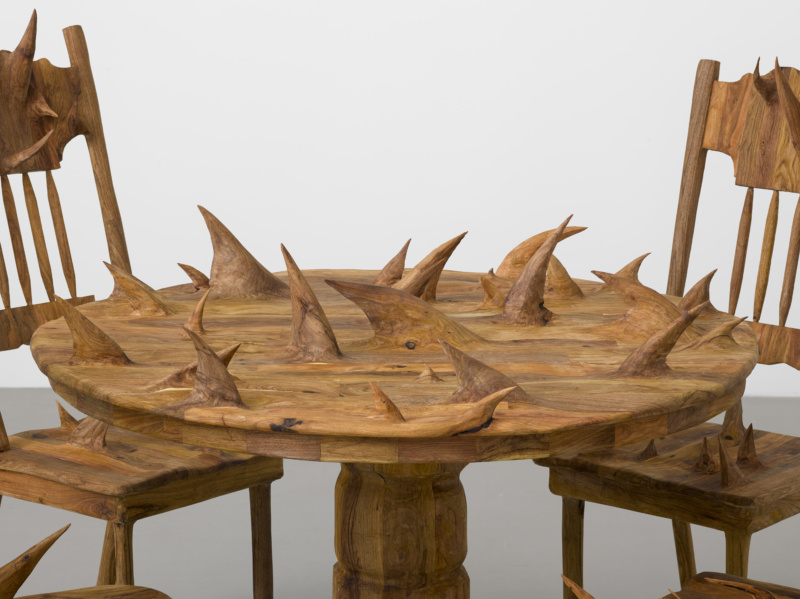 In “Border States,” the crib is joined by other works that reference American tropes, including a picket fence and dining room table—all with the same aggressively protruding thorns. Fabricated with wood sourced from the Texas and Mexico border, Hayden critiques an America that is putting up walls on the border, becoming a country of increasing divide. 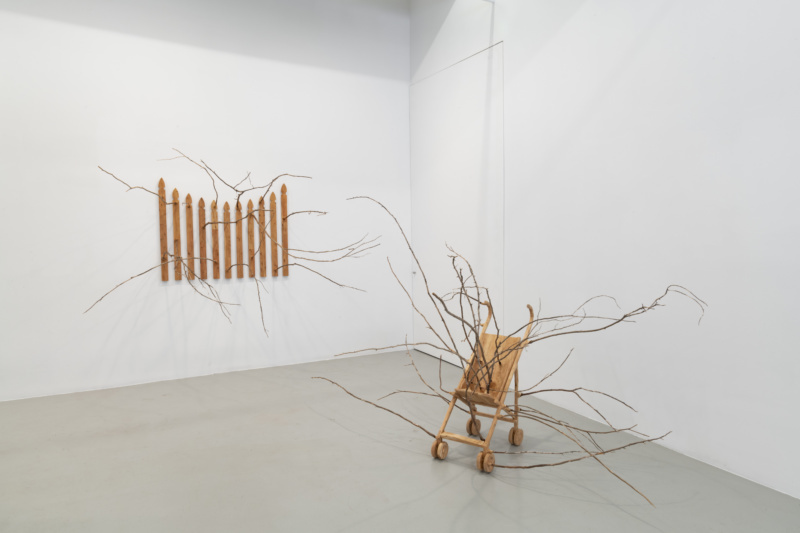 The show expands the material gravity put forth in Hayden’s first New York solo show at White Columns earlier this year, with his haunting use of naked Christmas trees found along Park Avenue. Searching for a wood that could convey more personal significance for the Lisson show, the artist found a species of tree called Texas Ebony. “It feels like a play on my own identity,” Hayden says.